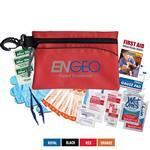 This sports first aid kit will be a favorite for any client to have on hand. Useful in many ways, it can be stored in a car or office, or taken along anywhere and convientently by parents. 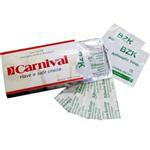 Packed with first-aid essentials this makes a great promotional item for your business, brand or resale. Made ofdurable polyester fabric, it has a drawcord closure and amenities that include: 2 ibuprofen, 2 first aid creams, 1 sunscreen packet, 1 Blistex® packet, three 3/4" bandages, 2 antiseptic towelettes, 1 jumbo bandage and 3 mini bandages. Customize with your logo or design on the bag. 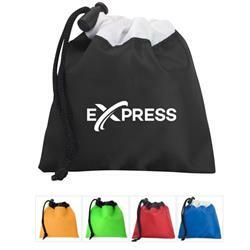 Great for convention gifts or team giveaways in little league sports teams and even medical events.